At Denver Jewish Day School, we emphasize the importance of our school’s middot with our students so they will grow accustomed to incorporating them into their lives, both at school and beyond. The more familiar our students become with the middot as they continue to grow, the quicker they become leaders in their DJDS community and their broader Jewish community. Students Alana Perlmutter (Class of 2018), Arielle Williamson (Class of 2018) and Sammy Sonkin (Class of 2017) embody these middot each day, and have developed strong leadership skills during their time at DJDS. Earlier this year, seeking to make an impact beyond our small school community, the trio decided to join the jHub Leadership Fellows Program. The jHub Leadership Fellows Program was created with the vision of getting Jewish teens more involved in their communities and becoming strong Jewish leaders regardless of where they volunteer or spend their time. Perlmutter, Williamson and Sonkin were all interested in joining the jHub Leadership Board, comprised entirely of high school students, to help lead the organization and vision of the program. 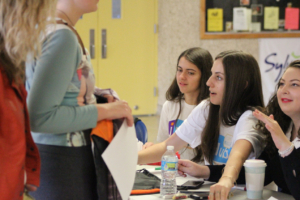 Their goal: to get as many people as possible involved in the Jewish community through various volunteer opportunities. “A lot of kids want to impact their Jewish community in some kind of way, but just don’t know how. That’s why Alana, Sammy and I wanted to get involved and join the jHub Leadership Board,” says Williamson. Towards the end of 2015, jHub proposed that the jHub Leadership Fellows Program should host a Leadership & Opportunity Fair for teens in the Denver Jewish community. Perlmutter, Williamson and Sonkin loved the idea, and they hit the ground running, leading the way to plan every aspect of the opportunity fair that needed preparation. The Leadership & Opportunity Fair took place in January 2017, and it was a huge success. 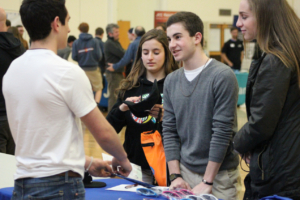 More than 30 different organizations attended the fair, and the opportunities for students ranged from summer activities to gap years and mitzvah projects. Over 80 kids from public and private schools from all across the Denver community attended the opportunity fair, and Perlmutter, Williamson and Sonkin were very encouraged by the turnout and proud of the results. “We put the Leadership & Opportunity Fair together to insure that everyone has the opportunity to get involved and do something they’re passionate about within their Jewish community,” says Perlmutter. One of Perlmutter, Williamson and Sonkin’s goals was to include a wide array of organizations and opportunities at the fair, so kids had the chance to find something they truly wanted to work on or were comfortable with. “We are very proud to have Denver JDS students fulfilling the middot we teach at school by getting involved in a terrific organization like jHub,” says Head of School/CEO Avi Halzel. Sonkin will be graduating in the DJDS Class of 2017, but Perlmutter and Williamson are Juniors and plan to remain heavily involved with jHub during their Senior year.